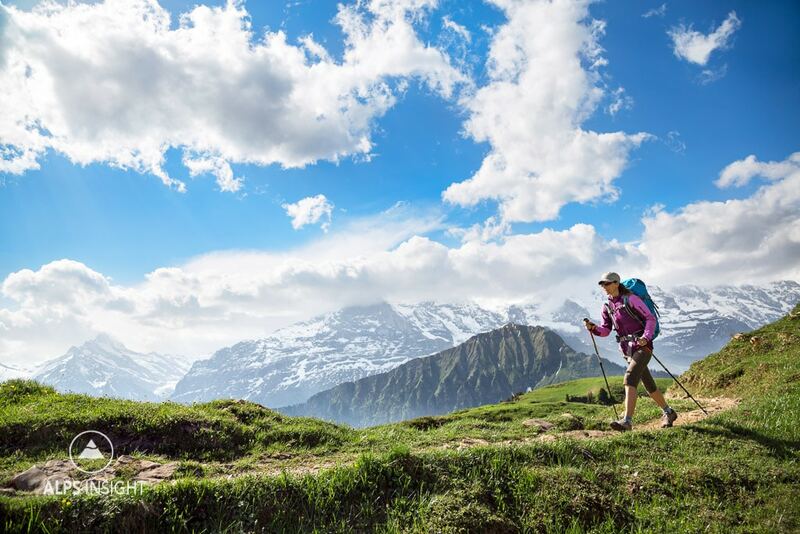 The Grindelwald High Route is a Jungfrau Region classic day hike. Most everyone doing this route will start on the cog train to the Schynige Platte station. 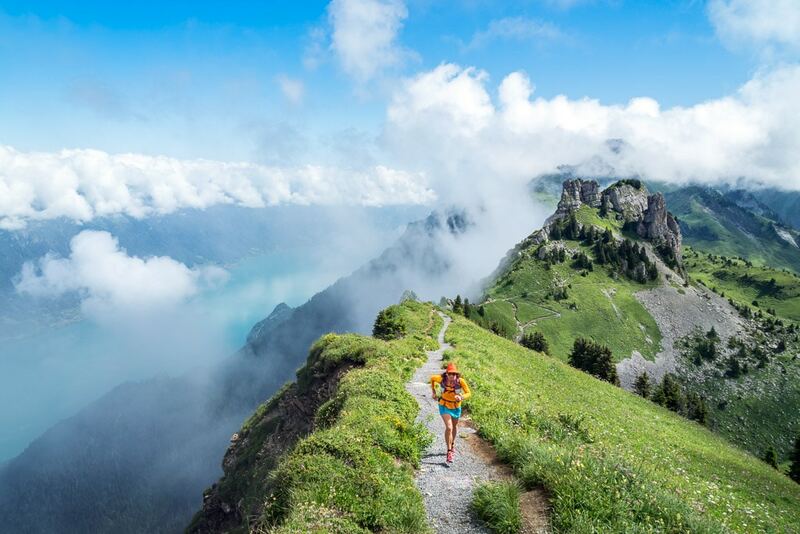 But, runners may want to include the 1600 meter climb from Interlaken to Schynige. From Schynige Platte, the trail heads east near the crest of a long ridgeline with views down to the Brienzersee (Lake Brienz) on the left, and some of the region's best views of the Jungfrau Peaks to the right. After this section you’ll wander through remote feeling rocky terrain for a time before reaching the Berghaus Männdlennen, an opportunity for calories and/or caffeine. 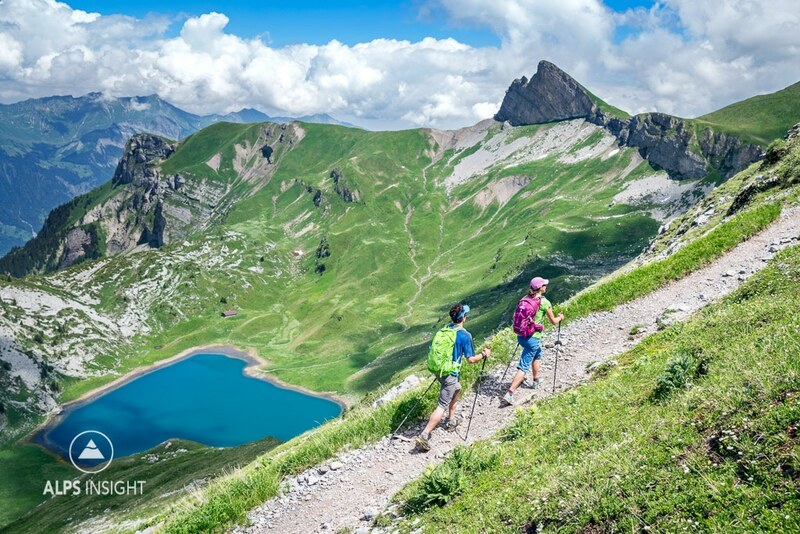 After this it’s a short climb to the Faulhorn (2681 meters, your highpoint) before a long descent on one of the most scenic panorama trails anywhere along the shore of the Bachsee. Shortly after the lake, you'll arrive to the First restaurant and lift station. Here, most hikers will climb into a gondola for the long drop to Grindelwald. But you do have the option of continuing down to Grindelwald (1200 meters down) on trails. From Grindelwald, trains run every half hour back to Interlaken. For trail runners, much more information is available at our Elevation Schynige Platte to Grindewald Run. TIP: This is a great day hike, so... make a day of it! Plan to stop at the Berghaus Männdlenen for something to eat or drink. And carry a picnic and eat at one of the many jaw dropping view points. Just be sure to know what time the last gondola goes to Grindelwald from the First Station. The map shows the option of starting on the trail from the Wilderswil train station. However, most everyone takes the cog train from Wilderswil to Schynige Platte and starts at the trail from there. Leaving the Schynige Platte bound for the First Station. Hiking above the Sägistalsee before the Berghaus Männdlenen. Thanks for your fantastic blog! It’s a truly invaluable resource. I wonder whether this route can be hiked in 2 days – with an overnight stay at the Berghaus Männdlenen, and on the 2nd day a descent to Grindelwald via First or some more straightforward route, all on foot. The point is, I’m trying to connect this route with another route of yours, the Bäregg and Schreckhorn Huts (also stretched into a 2-day hike), to make for a not-too-difficult 4-5 alpine hiking experience. This would probably necessitate a night’s stay in Grindelwald, assuming Männdlenen-Faulhorn-Grindelwald takes the better part of the day. I’m reasonably fit but I’m a hiker, not a runner. Are my assumptions correct, especially regarding the extra night in Grindelwald? I’d greatly appreciate your feedback. You can certainly do this the way you describe but the days will be pretty short. Depends on how big of days you’d like to have, most people hike from Schynigge Platte to Grindelwald in one day. It’s a classic day. Thanks for your reply! Yes, I realize you can hike from Schynigge Platte to Grindelwald in a day. My question, though, was about hiking right from Wilderswill train station (adding the big 1700-meter ascent). Is that feasible in a single day, too? This is for sure possible, I have done it many times – but I don’t know you so it is impossible for me to say. It adds a lot and means going light is important – this is a route I run and am carrying very little. An option is to take the First cable car into Grindelwald to avoid the big descent and cut off distance. No matter what though, you will have a great full day. Would you happen to know where would this trail begin if I start in Grindelwald? The easiest one to find and follow starts right at the Firstbahn. Thanks so much for your reply – would you know how long will it take for me to hike this trail?? Plan for a full day out! Thank you for the excellent information! I will be visiting at the end of September. Shall I expect the weather conditions to still be good for trail running in the Jungfrau region? No guarantee but September is one of the nicest months in the Alps. Thanks a lot for sharing the route ! It is a very nice & strong climb up to Schynige Platte, and no crowd with a 7am start in Interlaken (even on a beautiful Saturday). Running the long plateau is a cool experience, quite special compared to the constant ups & downs usually seen in the Alps. The route can be extended all the way to Rosenlaui, you get a long day of high-altitude running ! (42km 3200mD+). Going to Grindelwald next week. Planning on linking this route with the Hardergrat over two days. First day going from Grindelwald to Interlaken and next day from Interlaken to Brienz. Anyone having any thoughts or recommendations regarding this? From what I’ve read so far Hardergrat seems to be the tougher one requiering a super early start (~4am) whilst Grindelwald-Interlaken might be a bit easier (but it shall of course not be underestimated). How many hours should I consider for the route from Grindelwald to Interlaken? It looks our wording is a little confusing, it isn’t dizzying in terms of exposed, only that you are very high and directly above the lakes, but on a very flat, safe trail. No worries! Ah, so it’s nothing like Hardergrat? That’s very reassuring. Thanks and love your site. How long will it take to hike the whole thing (assuming taking a ride down at First)? Also, how long the hike up to schynige platte should take?